How much does a bubble weigh? 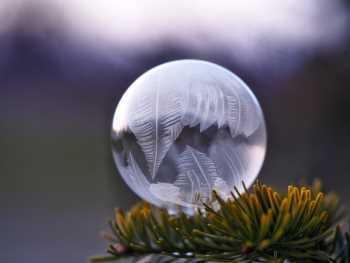 For the holiday season, and inspired by Aaron Burden's wonderful photo of a frozen soap bubble, I have pulled out my physics education to estimate the weight of a soap bubble. First, what is the volume of a spherical shell? For a very thin shell, as we have here, we can approximate the volume as the surface area times the thickness of the film, so it is 4*pi*R^2*t. Thus a 1 cm diameter bubble shell with a 0.5 micron thick film would have a volume of 1.6 x10-4 cubic centimeters. Since there are no interference colors in the photo above, the bubble must be less than about 1/3 micron thick. Of course the thickness of the bubble film varies from the top to the bottom as the liquid runs down. But when you see interference colors the film is typically less than half a micron thick. As the bubble dries you can easily be 0.25 microns thick. Water weighs about 1 gram per cubic centimeter. The other components in soap weigh about the same, so our the shell of our 1 cm diameter bubble will weigh about 1.6x10-4 grams (160 micrograms). At the beach the inside of the bubble will contain air at about 1 atmosphere pressure, 1.2x10-3 grams/cubic cm (at 20°C), up here in the mountains about 10% less. The volume of our 1 cm diameter bubble is 4/3*pi*R^3 = 0.52 cm^3. So the weight of air in our 1cm bubble is 0.52 * 0.0012 = 6.2x10-4 grams (620 micrograms). So the total weight of the bubble is 6.2 +1.6 = 7.8 x 10-4 grams (780 micrograms), about one quarter soap film and three-quarters air. So it is no wonder that the bubble will float on the breeze. If we fill our bubble with helium the weight of the helium in the bubble will be a tiny 8.6*10-6 grams, so most of the weight of the bubble will be soap film, and the bubble should soar, the bubble will weigh about a quarter of the air it displaces. If we fill our bubble with methane at 20°C, the gas will weigh 3.4x10-4 grams (370 micrograms), and the soap film will weigh 1.6 x10-4 grams (160 micrograms), so the total would be about 5.3 x10-4 grams (530 micrograms), still about 2/3 of the weight of the air it is displacing, and it will float with an upward buoyancy of 90 micrograms. Which points out a principle that is sometimes misunderstood. Hydrogen has half the weight per cubic meter of helium, but it doesn't have twice the buoyancy, which is the weight of the air displaced minus the weight of the gas. As the diameter of the bubble increases, the weight of the shell will increase proportional to the square of the diameter, and the weight of the gas inside will increase as the cube of the diameter. This means that a bubble will be more buoyant the larger it is. Disclaimer: Information presented here is the opinion of the author. No warranties regarding the correctness or value of this information are implied or should be assumed.